Two hundred years later, Lieutenant Cordelia Ross is a paladin serving the Storm Lord, her city’s patron deity. Her faith is absolute until her people are attacked by a native species, harmless creatures turned devious by an unknown hand. Cordelia tries to solve the mystery of their development before they kill anyone else, but the secrets surrounding them are too deep. As orders from the Storm Lord begin to value obedience over integrity, Cordelia wonders whose side her god is really on. This was a truly enjoyable read. We first read about the incident that starts everything, the mishap with the ship and how everyone who was awake finds themselves with strange powers, and how the copilot, Duè, sends everybody else down to the planet below. 200 years later, we join the descendants of those colonists on the planet. Most of the empowered crew in orbit have claimed areas of land, and the people who live there as worshippers. 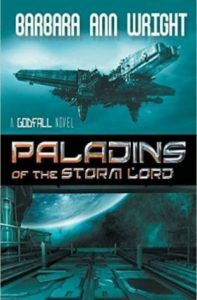 This story revolves around the Storm Lord, Colonel Dillon Tracey, and his Paladins and worshippers down below. Because the Storm Lord has gotten bored. He’s decided to once again mess around with things on the planet. His special project this time is supposed to net him some slave labor out of one of the indigenous mammals to use to mine the scarce metal resources on planet. Something goes wrong with the experiment. And his fellow crewmates on board the starship have decided something must be done, so Dillon decides to make planetfall. Meanwhile, in the Storm Lord’s city of Gale, Lieutenant Cordelia Ross has been having strange encounters of the native species the humans call boggins. They seem smarter somehow. She is sent on a series of missions that have her interacting with the native sentients, the drushka. Things are going to get bad before they get better, and at the bottom of everything is the one thing that Ross hates most: politics. Ross and her friends, human and drushka alike, must struggle to figure out exactly what is going on just so they can survive it, and it’s going to take all of them to come out alive at the end. She doesn’t know who she can trust, and her thirst for vengeance might end up costing her everything. A couple of themes here that are interesting. Dillon as a God is just as flawed as he was as a human, only now there isn’t anybody who can stop him from doing what he wants. The other crewmen seem to be just as petty and shallow as Gods. The two exceptions are Lazlo, the healer who keeps everyone alive by regenerating their cells, and Duè, who seems to have all the powers of the others combined, as well as a few more. It seems like all of that power in a previously human body has broken her mind, and she seems more than a bit crazy to the others. By the end of the book, it becomes clear that Duè is manipulating people and events toward an outcome that only she can see, and we can only hope that whatever her goal is, it’s better for the colonists in the long run. There are many things unresolved and foreshadowed at the end of the book, so I’m assuming this is the first in a series. I would definitely pick up the next book. It seemed a little slow in the beginning, but soon events were avalanching out of everyone’s control, and the mad dash at the end kept me riveted. I would definitely recommend this book for anyone who has a love of sci-fi. An intricate and at times perplexing novel one that can be appreciated at many levels, adventurous sci fi or one that is politically motivated with a very astute look at present day human behaviour. Dealing with different alien races could be comparable with today’s political climate of cultural and ethnic unrest. Colour of skin and national diversity echoing historic roles of slaves and white masters. The fighting tactics undertaken by the Paladins resembling those employed by Roman soldiers. The overall and traditional command Generals have over their troops the same then as now. There was even the juxtaposition of those who use cocaine in today’s society and the effects it has and the use of “Grit” in the novels was frighteningly similar. Some humour was generated when love at first sight was compared to some races having an aroma that can captivate you and make you fall in love. I felt the quote, “old men playing with young men’s lives” regarding the quest for ultimate power through war, summed up much of this novel. There are many levels to this extraordinary and well written book. I did find it the plot very complex at times but overall a fascinating and intriguing book. Barbara Ann Wright writes fantasy and science fiction novels and short stories when not adding to her enormous book collection or ranting on her blog. Her short fiction has appeared twice in Crossed Genres Magazine and once made Tangent Online’s recommended reading list. Her first novel, The Pyramid Waltz, was one of Tor.com’s Reviewer’s Choice books of 2012 and was a 2012 Foreword Review Book of the Year Award Finalist as well as a Golden Crown Award finalist. It won the 2013 Rainbow Award for Best Lesbian Fantasy and made Book Riot’s 100 Must-Read Sci-Fi Fantasy Novels By Female Authors.. Her third novel, A Kingdom Lost, won the 2014 Rainbow Award for Best Lesbian Romantic Fantasy. She is a member of Broad Universe and the Outer Alliance and helped create Writer’s Ink in Houston. She is also a member of the Round Rock Writers Guild and the Austin Speed-Writing Challenge.